I'd hate to go to the dealership, but I wonder if they can fix it with software... And if they can... Can I just do it at my house without them? I was looking for a cheap solution to get an AUX jack since I have the car, got my hopes up and everything. I have the base model in my 2013 focus, single wide radio connector+usb+antenna. I have found the AUX jack pinout in a similar thread and today I have tried to solder a wire to pins 6,17,18. Assembled it back (lost a torx bit down the hole :[ ) but it doesn't work. When switching to AUX only USB playback starts, but my phone showed "headset connected". Any ideas how to proceed? What else to try to get it working? First, I have an 2011 Focus with basic cd unit and USB in the glove compartment. The basic cd unit has only one large connector with 26 pins, an smaler one for USB and on for antenna. I don't know how you managed to solder the wires on so small pins. I've got three wire from another cable, those wire already had the electrical terminal so I could insert them in the cd unit connector (the large one) on the empty places of pin 6, 17, 18. It is a little bit tricky, you have to unlock this connector first so that you can actually insert any terminal in an empty place. This three wire I route them thru the dash until I got them in the glove compartment where the USB already sits. Here I soldered the female jack. If your cd unit hase two large connector than I am not shore that this will work because in this case the AUX and the USB are managed form an separate sync module or media hub. I have the basic, one large connector radio with only USB in the center armrest. But still I think there might be some module there as well, because I cannot seem to override the USB being the only option once AUX is selected as a source. Also I need to think of a better way to connect the jack since soldering directly to the units pins isn't the greatest. Hacked the head unit, finally got aux in. Cheers to all the fanatics! With your answer, seems like the old radio does have aux input (as I thought so too). Can you please tell me in which order the pin numbring start? I couldn't find any reference guide on this. If I find some more details on this, perhaps I'll be able to poke into my own wires to take aux line-in out. The aux port is just a connector with 3 wires. There are difference in the old and new cd units. Old units have one big connector, an usb port and an antenna connector. The aux port wires goes in the big connector at pin 17 & 18 for right and left channel and pin 6 for ground. Now the new cd units have two big connectors. 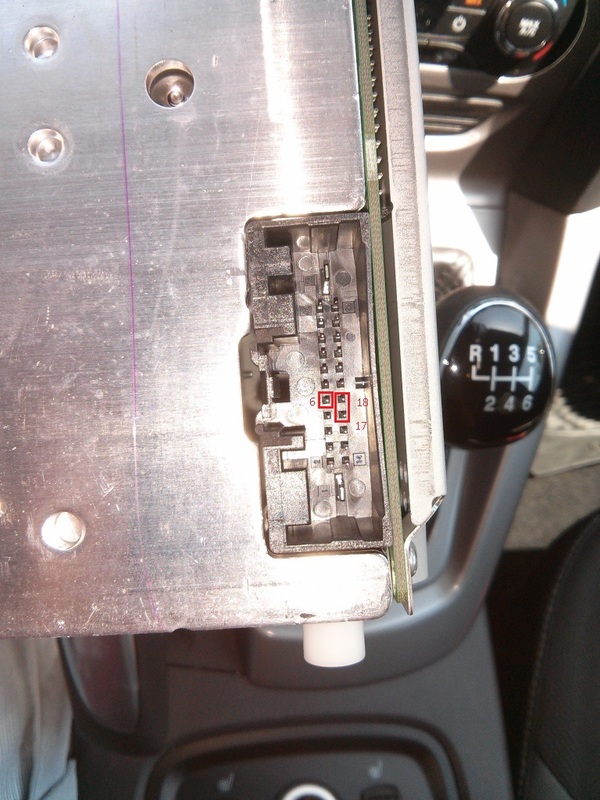 The aux port is routed trought the bluetooth/voice module then passed to the cd unit on the above mentioned pins. So the wiring in this two situation are diffrent. First picture you see old cd unit with usb connector and second picture you can see new unit with two big connector. Pin 17, 18 and 6 are located on the big connector from the first picture, respectively the connector an the left side on the second picture. On the 2nd image, what is the 2nd connector suitable for? I have the same car stereo on my Ford Focus 2012 and the aun-in jack and usb don't work at all. Some say it does not software installed from factory..??! Weird....so, i'm loking for an alternative to bring out, at least, an aux-in jack from the car stereo. Does this 2nd connectorallow me to do that? That is the CD unit for high audio with Bluetooth voice control and/or sync. That conector is probabile for those function. Is there a way to bring out an aux-in jack, or bluetooth, from that 2nd connector?